[SatNews] On its eighth launch of the year and 12th Soyuz launch from the Guiana Space Center (Flight VS12), Arianespace will orbit the two latest satellites in the Galileo constellation. Carried out on behalf of the European Commission, under a contract with the European Space Agency (ESA), this mission will orbit the Galileo FOC (Full Operational Capacity) 9 and 10 satellites. Arianespace is very proud of once again working with Europe by launching this satellite navigation system. Galileo is a European project for a new global satellite navigation system. Under civilian control, Galileo will deliver guaranteed, high-precision positioning services. As the first common infrastructure developed by ESA and financed by the European Union, Galileo incorporates a number of innovative technologies, made in Europe for the benefit of its citizens Arianespace, serving Europe. The first Galileo launch, with the IOV (In Orbit Validation) 1 and 2 satellites, used a Soyuz rocket (VS01) on October 21, 2011. Arianespace then launched Galileo IOV 3 and 4 on October 12, 2012 (VS03). These missions were performed from the Guiana Space Center (Europe’s Spaceport) in French Guiana. The two experimental satellites, GIOVE-A and -B, were launched by Arianespace’s Starsem subsidiary, using Soyuz rockets from the Baikonur Cosmodrome, in 2005 and 2008, respectively. 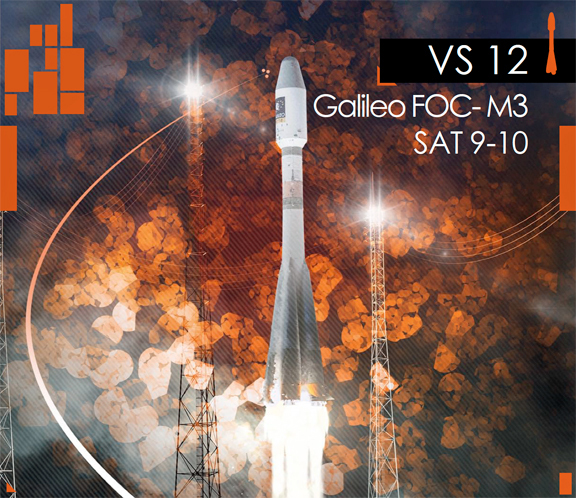 The first two Galileo FOC M1 satellites were launched on August 22, 2014 aboard a Soyuz from French Guiana. Despite the injection of these satellites into a non-compliant orbit, ESA managed to re-position the FOC 5 and 6 satellites, and validate their operation. The FOC 7 and 8 satellites were successfully orbited on March 27, 2015 by Arianespace from the Guiana Space Center, using a Soyuz launcher on Flight VS11. Arianespace will continue to deploy the next four FOC satellites utilizing two Soyuz launchers, with the remaining 12 spacecraft to be orbited by three Ariane 5s—all of them from the Guiana Space Center. One more Soyuz mission for the Galileo program is planned at the end of 2015. The current Galileo satellites are built by Bremen-based OHB System as prime contractor, with their navigation payloads provided by Surrey Satellite Technology Ltd. UK, a 99 percent-owned subsidiary of Airbus Defence and Space. The two spacecraft to be orbited by Arianespace on Flight VS12 will be the fifth and sixth OHB-built satellites.